Probably the best magic gag since the Funkenring! 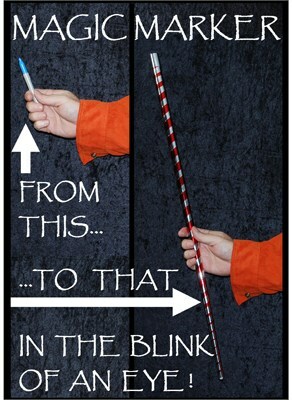 A genuine sharpie marker turns into a cane in the blink of an eye - but the effect on the audience is even more amazing! Adults and kids will jump out of their skin, freak out for a moment, or just laugh out loud! This cool effect brings the Appearing Cane right up to date. Any time you do a trick with a card or a bill that you need signed, try this - reach into your pocket, take out the Magic Marker and WHAM - it's a magician's cane. This is guaranteed to generate big laughs and an amazing reaction. This is strong, visual magic that people remember and talk about. Great for adults, teens and kids! After inventing this, Keith put this straight into his show and it has become a feature item. He has used it on stage, in close-up, at parties, and for kids shows. Keith's audiences are really surprised, and yours will be too. If you like magic that catches audiences off guard, if you're looking for a little practical joke or something that will really startle a spectator (in a good way! ), order one today and make your Magic Marker truly magical... and surprising!